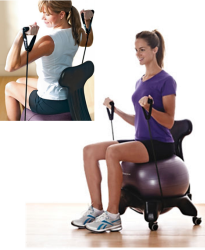 By sitting and balancing yourself on a stability ball, you can improve core strength and posture. And by sitting on a hybrid between a standard office chair and a stability ball it’s easier to maneuver and won’t roll away when you get up. 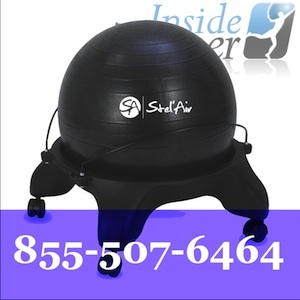 The stability ball is accommodating for your comfort. You can inflate or deflate it to adjust the firmness with the air-pump which is included with your purchase. 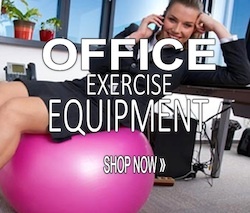 Referred to as “active sitting” while on a ball, you use your legs, abdominals and back. Its a bit of an adaptation if you have never sat on a ball before. You might even notice you have sore muscles the first few days. 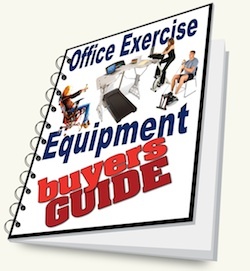 Consider easing into it and keep your old chair handy as you adjust. By tilting your hips forward and back or side to side you engage your core muscles and if you just lift one leg slightly you get a workout. Coupon Code: BALL10 at checkout! Attaches to most office chairs. Entire body workout. Core exercises while you sit with better posture on a ball. I have a customer to seach the ball desk chair. Can you sand me some pictures and the price list . Are you shipping us free ? If not, can you send me the price withit ! I sent this to your email address. Do the wheels lock? What prevents the ball from coming out of the base? A strap or something? The base has a groove depression with open bottom so the ball sits nicely. It won’t roll off the base without lifting it off. No – the wheels do not lock.